Atlanta, GA: The global advancement of women is as powerful today as it has ever been. Women are encouraged to pursue their personal, professional, and humanitarian goals with the support of one another and their communities alike. 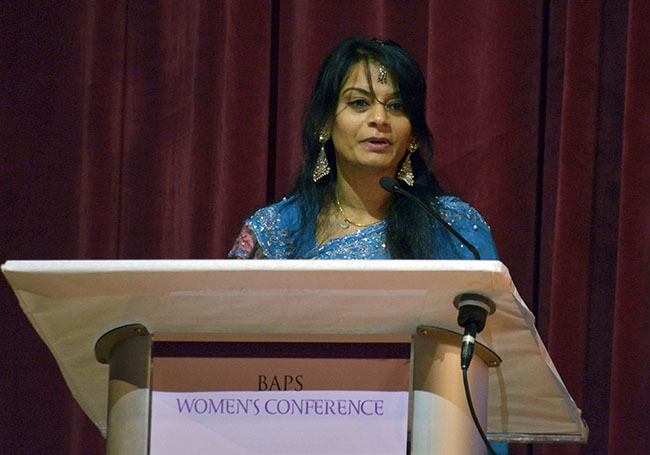 This year BAPS hosted its ninth annual Women’s Conference that took place at eleven centers across North America to inspire women of all ages to push themselves further in the pursuit of their dreams, while making a commitment to bring other women along. The conference, themed “Moving Forward,” focused on creating positive change that starts from within. 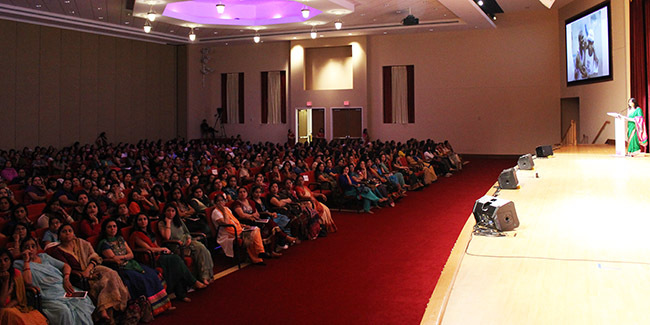 On Saturday, March 15th, 2015 over 650 women gathered at the BAPS Shri Swaminarayan Mandir in Atlanta, Georgia to participate in this annual conference. Moving Forward was held over one-day, and challenged the audience to consider three key concepts: compassion, forgiveness, and perseverance. The ability to practice forgiveness and demonstrate compassion help one move forward through life, but one must also persevere to overcome the challenges and difficulties faced through life. Dr. Jayshree Patel Pharm.D. asked the audience to recall the incidents “We cannot rest after one challenge. Life will continuously throw challenges at us and we too must persevere through life’s challenges.” She created a personal connection amongst all of the women present, helping to realize that each of them are connected – “as a woman, we wear many hats – caregiver, teacher, cook, and my personal favorite referee.” With this mindset, it is important to realize that one needs the right motivation and strategy to continue move forward in life. 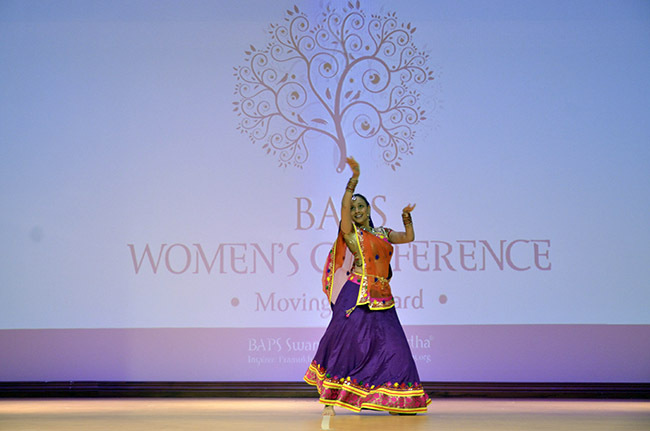 The event included performances from Mrs. Mital Patel, a Software Engineer, who completed a deeply moving abstract dance on the concepts of compassion and perseverance through Kathak, a traditional Indian dance known for its intricate footwork and use of facial expressions. Ms. Yogini Patel, a current student at the University of Georgia, also performed an intense poetry reading, titled Yashoda the Compassionate, describing the internal struggles faced when overcoming different experiences. In closing to the conference, the keynote speaker, Dr. Nazeera Dawood, the current Health Promotion Division Director at Fulton County Department of Health and Awareness, motivated the audience by creating an environment of introspection. Sharing her own journey, she took the audience through a journey of her pathway to overcoming the many challenges and trials she faced by recognizing her ability to continue to strive forward. She built an atmosphere of camaraderie amongst the women, recognizing and realizing that each women shared power of perseverance was within them all, they just need the right strategies and motivation to continue moving forward in life.